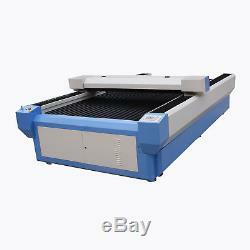 Professional Laser Cutting & Engraving Machine 13002500mm. Laser Cutter & Engraver Reci W6 130-150W CO2 Laser Tube with CE, FDA. With USB, Laser Interlock System, No water Warning. The outstanding feature of CM1325 is offline control system, Double open door, English LCD, USB interface, Water protection system, support CAD and CorelDraw output directly. CNCCheap order all our products directly from factory, no agents, no middleman, which allow to have competitive pricing. Laser tube type: Co2 Glass sealed laser tube. Laser power: Reci W6 (130 - 150W). Driver type: Micro Stepping Motor. PC Interface: USB2.0 and USB Disk. Image form: HPGL, BMP, GIF, JPG, JPEG, DXF, DST, AI. Package Dimension (L/W/H) : 334020401400 (mm). Package: Standard Wooden case for export. Sketch map of Optical system, the laser beam is from laser tube, then reflecting mirrors and focus lens, As following. Output from Auto CAD directly. The network connection with the IP address of machine. Just one PC with 2/3/... Units machines, Never a problem! Processing of mutual motion of double heads Use virtual array list and additional off-cut graph to realize the off-cut function. Feeding Processing Machines with feeding devices can realize the cyclical model of working-feeding-working. Processing of large file segmentation When the length of the file to be processed is very large and exceeds the vertical dimension of the current machine, it can use the function of processing for large file segmentation if the machine has feeding function. CNCCheap Laser Engraving and Cutting Machine is equipped with Co2 laser Tube, It is used to engrave or cut wood, bamboo, plexiglass, crystal, leather, rubber, marble, ceramics and glass and etc. Non-metal materials , it is most suitable and the preferred choice of equipments in industries such as advertisement, gifts, shoes, toys and etc. Laser Engraving software Package (English Version). 3 Reflect optics (installed in the machine). We can provide all of spare parts of any model we listing. I have heard the mirrors need cleaning? Yes they do but not after every job, once a week is normally enough. Can I put larger materials in the machine? Yes, the machine has doors which can be opened to accommodate larger materials. The item "RECI W6 150W Co2 1300x2500mm Flatbed Laser Cutter Laser Cutting Engraving USB" is in sale since Tuesday, October 24, 2017. This item is in the category "Business & Industrial\Printing & Graphic Arts\Screen & Specialty Printing\Engraving". The seller is "cnccheap" and is located in CN. This item can be shipped to United States.